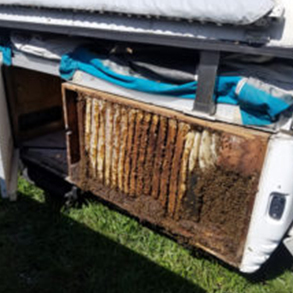 Our first step when you have a bee or similar insect problem is to find where the bees and the hive are located and if it is possible to remove them without injuring the bees or hive. 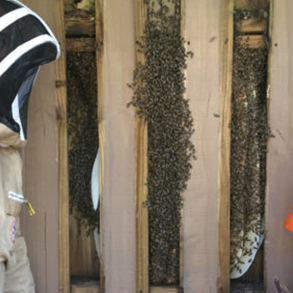 Keep in mind that bee hive removal requires patience and time. Bees are very small and they find their way into holes that are so tiny that it becomes necessary cut away part of the structure in which the hive or bees are located. Our goal is to send all our hives we relocate to local beekeepers so they can keep producing honey. The killing of honey bees can impact are ecosystem. However, we understand that sometimes bees make their homes right next to homes, playgrounds, and other areas where it could be dangerous for you or your loved ones to be around. 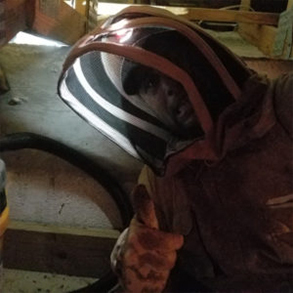 Therefore, we recommend not trying to remove the hive on your own without the proper equipment or trying to kill the bees. Contact us whether you just need advice or need us to relocate the hive.